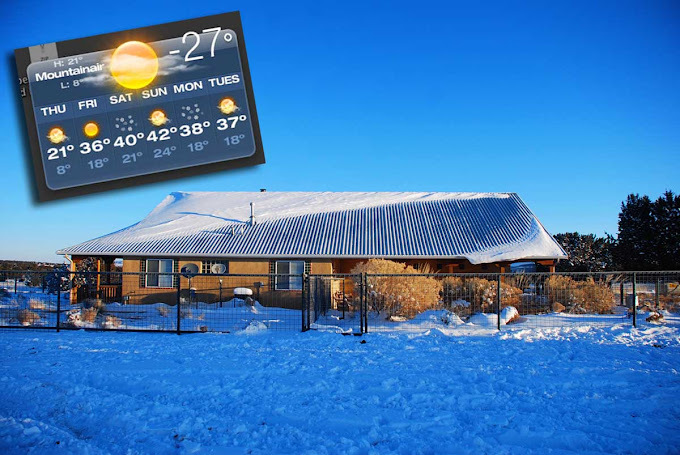 Just before I went to bed Wednesday night, I checked the temperature – it was minus 16 degrees. How is that even possible? I was in disbelief and denial. But the snow had stopped, the wind wasn't blowing, all the boys and girls in the barnyard were tucked in with plenty of food and water. There was nothing left to do but worry. Around 1:30, I got out of bed to stoke the fire in the woodstove. I turned on a light, only to discover that the power had gone out. Now isn't that special? No probem, I have a generator. I'll just turn it on in the morning when I need it, I thought. Then I remembered I hadn't turned it on since August. Then I convinced myself it would never start up. Then I laid awake all night devising Plans A, B, and C for getting the morning chores done without water (the well pump needs power). Then one of the smoke alarms started chirping, driving Smooch into a frenzy, and I went out into the garage, got the ladder and changed the battery by candlelight. Are we having fun yet? Then I started filling pots with bottled water to heat up on the woodstove. 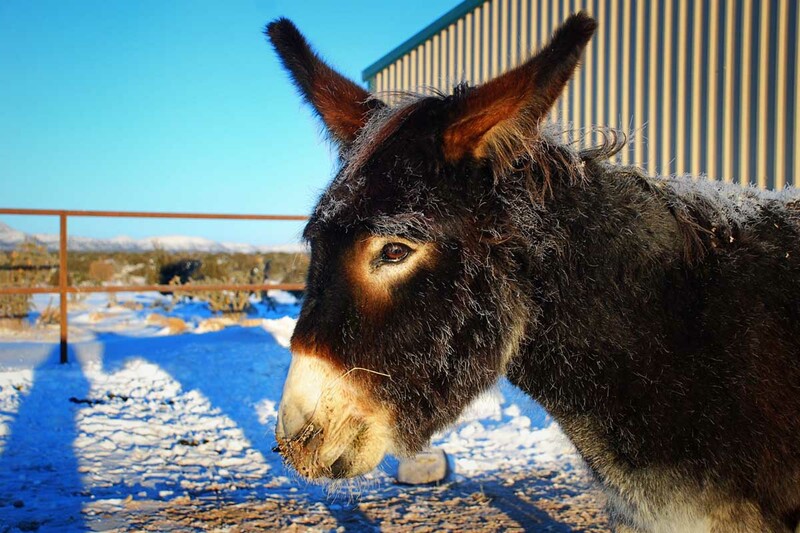 Wynonna would need her hot oatmeal, and Hank would need his hooves soaked to remove the ice balls, and I would need to dump a pail of hot water in the solar trough to free up the float (otherwise, the water in the trough has stayed liquid, amen). Anyway, by now it's almost dawn and I ventured outside to see if the generator would start, knowing full well it wouldn't. But it proved me wrong! I danced through the morning chores, I was so happy. The boys didn't seem any worse for wear, and once I dug Wynonna out of her straw, she was fine, too. The chickens were mad that I wouldn't let them out of their coop, but I convinced them it was for their own good. Once I got all the chores done, the light was looking particularly nice so I grabbed my camera. I had never seen frost like this before. Alan and George were both working the Andy Rooney eyebrows. 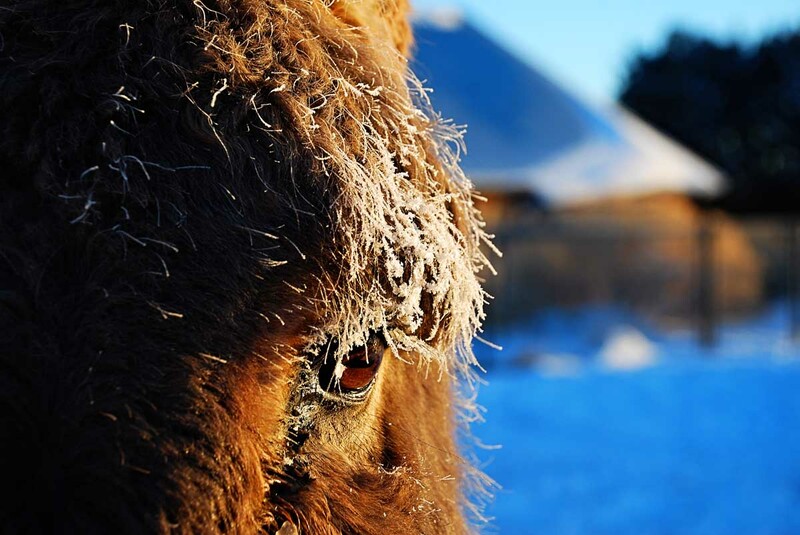 I thought Hank's frosty lashes looked rather stunning. Alan's eyes might have been frozen wide open at this point...it was Cold. 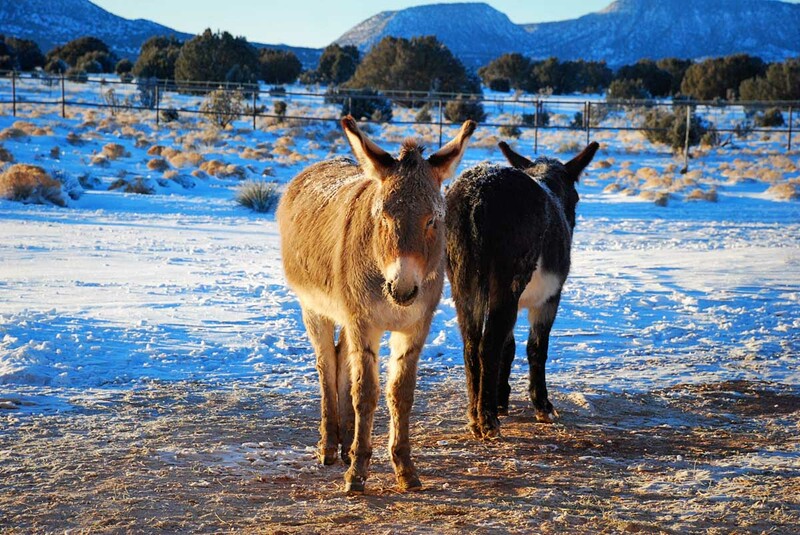 Both burros seemed very tired – as soon as the sun came up, they stopped eating to soak it in. then I decided this must be a burro's way of keeping his core warm. If I had had a tail, I would have been clamping it down, too, but I went back into the house instead. Once I got the coffee made, I turned off the generator, pulled up a chair in front of the woodstove, and planned to read until the power came back on, which it finally did around 8:45. I turned on the computer and looked at the temperature widget to see how cold it was. and that the generator gods were on my side. Oh my gosh, what an adventure!!! By looking at your forecast it seems you're going to have a 'heat wave' over the week end! I'm glad everyone is ok ... great facial pictures of the boys. The frosty lashes look great but thats for sure not a good feeling for the boys. Good that the sun came out. And the sky is blue as always, unbelievable! Oh my goodness!!!! You have Canadian cold weather!!! sending warm thoughts to you and the gang! My word that's cold. I'm surprised the animals can live through that! Glad all was okay and it appears the temps are headed back up. Yippee!! Makes y'wonder how people ever lived without electricity, doesn't it? Wow, you have had quite a night (and morning). Living in WI I definitely feel your pain! However, you did get great photos, bragging rights, and the best part is...it will warm up within days! that's COLD! but very pretty too. good thing the generator worked! Tail clamp! You always make me laugh. Interesting snow pattern on your roof. Oh, thank the weather gods that everyone is okay..........when I read this early this morning I just wanted to scoop all of you up and have you gather under my down comforter ! Look like alittle rime frost. Stunning! What beautiful close ups of the boys' eyelashes! Hey, you can see where your woodstove is because there's no snow above it on your house! Good thing you have that stove! A lot of people up in our mountains have them, too, and they sure do work! Oh my, I can't even imagine how cold those boys must have been! I'd much rather have Alan's dark coat on that day. So glad everybody made it through ok. The sub-zero tail clamp... we had the same thing here. They look so sad doing that, don't they? I know I'll regret saying this, but 12 degrees this morning actually feels warm. Instead of soaking the hoof to remove the ice, try a small, claw hammer. If you use it as a hoof pick, the ice comes right out. It is what I use here in the NE and it works great. Wow! Now that is cold! Great pictures of the boys. Wow. Just wow. That's unheard of where you are! It's 22 above here this morning. I can't even imagine below. Stay warm and toasty! Now that, is cold. Our record here is -20, and I thought I was going to die. I can't imagine anything colder than that. I'm so glad it all worked out for you. Oh my! I'm so glad it turned out okay for all the animals and their mom! My MIL always had a wood stove and that thing would run me outta there. Good thing you've got one. Is that your only heat source? The pic's of the boys are great and yes, "tail clamp" made me smile too. Glad you made it thru the night. Now go take a nap! I can't remember it being this cold! My water pipes broke so not only do I have to haul water for the horses but I have to get water 20 miles away, I also have to get jugs of water for us to use too. My wood stove is cranking out the heat but still can't get the house much beyond 65-69. Will it ever warm up? Flartus, the hens have a distinctive I'm-very-mad-at-you squawk. Lisa, I tried the claw hammer thing on day one of this adventure - wouldn't budge. Then I tried a hot towel wrap around the bottom and sides of the hoof, then the claw hammer. Still no luck. The one-minute hot-water hoof soak is my sure thing. Nancy, I have a furnace but I choose not to use it. It's noisy and propane is way more expensive than wood. Yup...that cold made me exhausted too! Your guys sure put a lot of energy into staying warm - no wonder they were exhausted! Fabulous photos, capturing the frosty lashes like that. But I am stunned about the temperature -- here in Maine, okay, we see that, but in YOUR area?! Wow. You are an amazing woman! I never realized it got that cold in NM! OMG that is cold. I'm sure U stacked the wood in the summer for something just like this. U tweeted about water heater problems too. Got that solved? Seems it is always something. Have a warm day. Amen and Amen! Whoa. That's way too cold for me. Poor critters with their frosted...um...lashes. I warm Celine's water on a winter morning, too. Beautiful images, as usual. Warm hugs going out to you & the entire herd! Stunning photos of the boys lashes & brows - they look like they would break off if touched. Everybody band together and stay as warm as possible! Yowza... I have absolutely no idea what to even do with a number like -27. It's amazing that any living thing can withstand a temperature like this. Glad your temperature widgit is promising higher numbers in your future. Stay warm, you guys!! How could you possibly take pictures at those temperatures ? My fingers would break and fall off if I tried. Brrrr ! Looks like Alan, George and Hank are ready for the "Glamor Shots"! 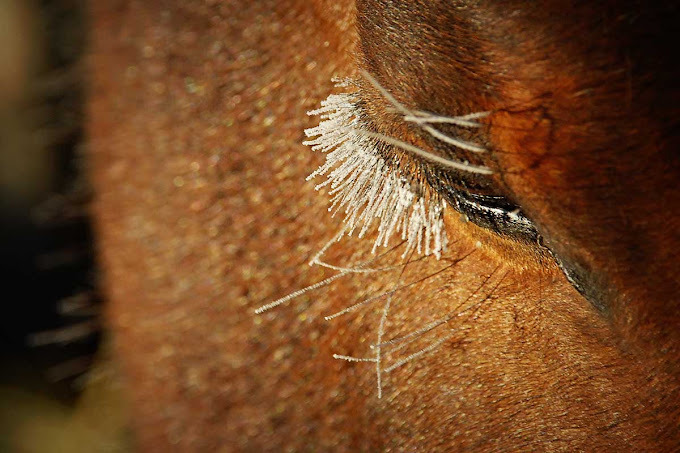 Beautiful eyelashes! We are unseasonable cold here in West Texas, too. We get cold, but not for this many days in a row. My chickens were unhappy with me, too--it's 17* now and they are outside and happy as clams. They had been shut in for 2 1/2 days while we had 10-20 below chill factors. Glad your generator worked. I've not had to use mine yet. 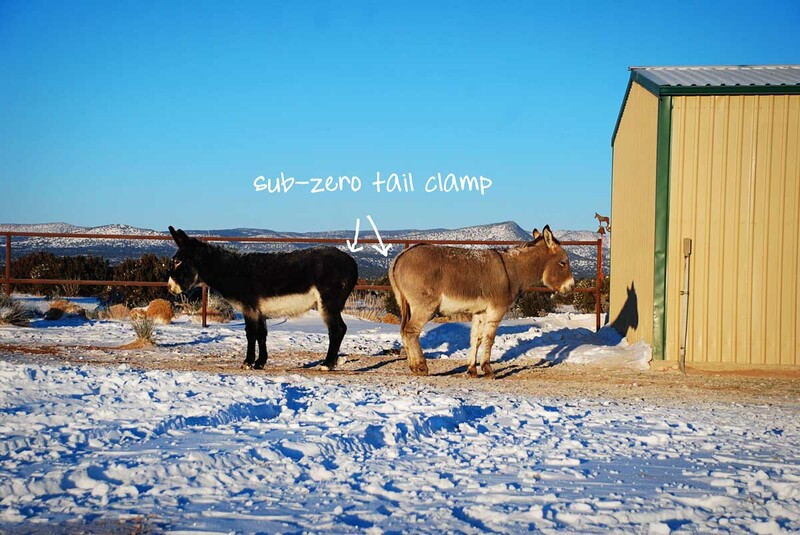 The tail clamp is a sure-fire way to know when equines are cold. I blanketed the horses cause they were actually shivering. All I could for Russel is dump a big load of shavings in his stall. He seemed ok. I was heating water on the stove for all the boys. We only went down to 22 degrees. Don't know what I'll do if it gets much colder. Love the 'Andy Rooney' eyebrow comment! :) Thank goodness for generators and woodstoves! Sending you some of our summer heat! I can't even imagine how cold that is. Do the boys not stay inside if it is cold? Or can they choose where to hang out? I know you are so thankful for the sunshine, working generator, and wood burning stove! Your closeup shots of the boys and their frozen lashes are amazing. Do you worry about your water pipes freezing and bursting? After 4 straight days in the 20's and lower, we are worried about the pipes when (if!) everything thaws.... 20 degrees and 3-6" of snow in the Heart of Texas this morning. So glad that the generator worked and that your power it back. Hope it stays that way. Great photos as always. Ice on eyelashes, I can't even imagine that kind of cold. Oh boy... 27 below is cold in anyone's book and doubly (triply ?) when you are used to 50-60+ !!! Glad all are ok and see you have hot water as well - hoo rah! I wonder how many times it has been warmer in northwest MT than in mid-to southern NM??? Joani, got the water heater up and running again. The generator runs on propane,and apparently propane flows more slowly through the lines when it's this cold. So when the generator was on, the propane didn't keep flowing onward toward the water heater and the pilot light went out. Anyway, another lesson learned and I'll have a hot shower tonight. Sharon, the boys can choose where to hang out, though when the storm started, I limited their options to the corral and the barn. cctxranch, I figured if I kept the house temperature above 60, the pipes wouldn't freeze. So far, so good. Eek! That's cold. Sounds like a bit of an adventure. So Smooch goes into a frenzy over the smoke alarm, huh? One of my dogs does that too. Not fun. Glad all worked out. Cold or not, you captured some beautiful morning moments. Wishing you warmth! Lightly spray WD-40 or Pam on the SOLES only of the hoof after the ice is removed. I used to use that when I rode through every kind of weather in PA during the winter. Flips the snow right out. Not too much though, can be slippery. You are getting Canadian weather! Looks like it won't last though; and that generator is a life saver. Ever since I've had the barefoot trim done on my horses they haven't had any problems with snowballs. Brrrrrrrrrrrr! I am so glad that you all made it through the night safely. I see someone mentioned the Pam trick, it works like a charm! We get frost that looks like that here, its called hoar frost. We don't normally get it when its really cold though. Egads. Lovely photos, though. Did the shutter freeze? Did you see that video that Dan and Betty had up - shows boiling water turning to snow the instant it hits the air. And that was a mere -22. Hi, just ran across your blog, what a pretty part of the country you are in. 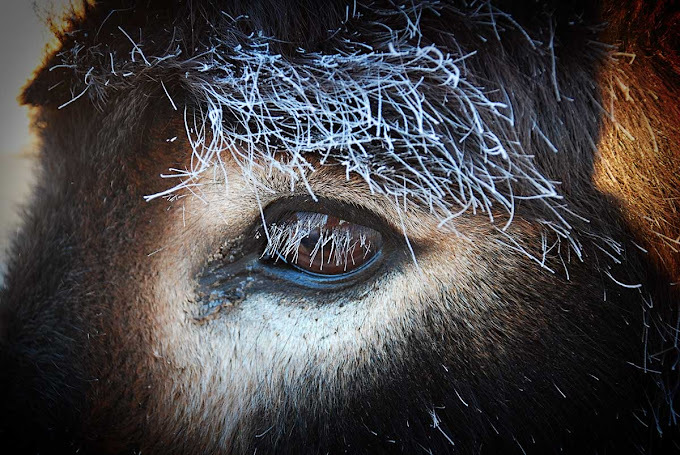 Love the pics of the snowy lashes. I grew up in Minnesota and we had many weeks in the -20 degrees. Our trick with keeping the snow balls less was coating thier feet with a thick layer of Hooflex or vasaline. Bagbalm would work too. Also no shoes on for the winter either. My mom found a big old iron farmers hoof pick that has teeth and a claw on it, and that worked to pop the balls right out with the no stick in between. Trick is to get the hoof bed dry before putting on the grease. Hope its warmer now!